The pharaoh was gradually becoming closely connected with Re and, after death, was going to accompany the sun god on his daily journey across the sky. After Khufu the name adopted by the pharaoh contained the syllable ‘re’, and the tutelage of Heliopolis, which was to come into full force in the Fifth Dynasty, began to make itself felt in the affairs of state. For instance, Prince Rahotep who, with his wife Nofret, was buried at Meidum, was a ‘son of the king’ (probably Huni), commander of the army and high priest of Heliopolis. Meanwhile the Heliopolis priesthood had established a cult by which Horus was worshipped as ‘Harakte’, a variant of Re. It was in this era, which had evidently begun with Snofru, that the influence of the solar cult made its first impact on the monarchy. For entirely different reasons, the use of the pyramidal emblem of Re and its exaggeration into fantastic proportions went hand in hand. The building of pyramids had become the foremost activity of the country as a whole and it was evidently sustained by the Heliopolitan priesthood. This possibly also had an effect on the structure and recruitment of the civil service. From early times the Egyptian civil service was of a dual nature, with offices corresponding to Upper and Lower Egypt, the Red and the White House. The highest official, who was the representative of the pharaoh, was the vizier to whose office the other departments, such as the Treasure House and the Store House, were responsible. The vizier and the heads of the other essential departments were usually sons of the king; during the first two dynasties royal princes also replaced local dignitaries as governors of the provinces. It seems that the vizier as supervisor of ‘all the king s works’ was in charge of pyramid construction which, as we shall see, was of paramount importance in the economy of the Fourth Dynasty. While Imhotep himself was evidently not a king’s son he may have been connected to the royal house by marriage. The Fourth Dynasty viziers were all sons of the pharaoh and their titles and offices are known from their mastaba tombs. The first vizier in charge of building operations who is known to us was Nefermaat, the son of a king, probably Huni, and who was buried at Meidum. His successor was a son of Snofru’s, called Kanefer, whose tomb is at Dahshur, and who may have been in charge of the work when the Meidum pyramid collapsed. However, the disaster did not harm his career since we know that Kanefer continued in office into the reign of Khufu. He was succeeded by his own son, Prince Hemon, Khufu’s cousin and his great architect, whose impressive and forceful portrait statue is in the Hildesheim Museum. Hemon is generally credited with building Khufu’s pyramid but there exists no definite proof for it except that the work seems to fall into Hemon’s term of office. It is possible that the vizirate was then conferred on Baufre and perhaps on Djedefhor, both sons of Khufu by Queen Merytyetes. However, there is a suspicion that they were eliminated in one way or another by Djedefre, whose vizier was another Nefermaat, a grandson of Snofru’s by his daughter Nefertkau. While the tombs disclose to us the names and even the portraits of the leading officials, and of many lower ones, who formed the administration of the Fourth Dynasty, they tell us nothing about the meaning of the change which the influence of the Heliopolis Priesthood created in the Egyptian monarchy. This change evidently brought greater power to the priests of Re and it was intimately connected with the building of enormous pyramids. ' With Menkaure, this phase came to an end, and it is possible that his pyramid is nothing better than a left-over from the previous gigantic effort. It almost looks as if existing material was used up, « as the labour force was being drastically run down. There is a suspicion that at this time the hold which the priests of Re had over the monarchy was declining and it may be signifi-rJ cant that Shepseskaf, Menkaure’s son and successor, did not build a pyramid for himself. He also forsook the Giza necropolis, erecting a tomb in the shape of a large sarcophagus at the ancient necropolis of Saqqara. This heavily ruined building, called by the Arabs ‘Mastabat Fara’un’, though much larger than the mastaba tombs of the princes, is quite small in comparison with the Giza pyramids. It contains only about 3.5 per cent of the masonry of the Khufu pyramid. Egyptologists have regarded the departure from the pyramid shape which Shepseskaf decreed for his monument as reflecting a weakening of the Heliopolitan influence on the status of the pharaoh. Early Memphite texts describe Ptah as protector of Horus, i.e. of the king, and it may be significant that the first known high priest of Ptah was Ptahshepses, a son of Shepseskaf. However, more important than abstract religious considerations or even the shape of the tomb appears to us the sharp decline in building effort which may have been foreshadowed by Menkaure’s monument. We have to remember that pyramid construction was by far the most important activity for the Egyptians of the Fourth Dynasty. When dealing in the next chapter with the economic effects of this large-scale technological enterprise we shall see that, by the time of Khafre, pyramid building may have exhausted its usefulness, becoming a burden on society rather than a benefit to it. The servants of the sun god who seem to have fostered the channelling of the country’s efforts towards gigantic representations of the solar emblem had possibly pushed the power of Re too far, and this may have turned the monarchy in its own interest towards the worship of the less exacting Ptah. If this was the case, the establishment at Heliopolis did not take it lying down. There is no record of any serious disorders at the end of the Fourth Dynasty, but when Queen Khentkaues, Shep- seskaf’s sister, became the founder of the Fifth Dynasty, she brought Re and his Heliopolitan priesthood back with her. However, the priests had now significantly changed the position of the pharaoh from god into son of god. It seems to have been a fairly smooth take-over, in which Ptah and his priesthood were not victimised, but simply relegated to their former dignified but innocuous position. The sun god was re-installed by a famous legend which has come down to us in the Westcar papyrus in the Berlin Museum. Although the papyrus dates from the Middle Kingdom it clearly goes back to an Old Kingdom source. According to it a magician, Dedi of Meidum, who had been brought before Khufu to demonstrate his supernatural powers, prophesied the future of the royal house. The descendants of Khufu, he predicted, would rule over Egypt for three more generations, but then the three next kings would be triplets, begotten by Re himself, and borne by the wife of his high priest. The legend, even in its corrupted form, bears the stamp of a priestly mythos, created to glorify the new dynasty of children of the sun god. The advantage of the new cult is immediately apparent. Being merely the son of Re, the pharaoh no longer required a monument of stupendous dimensions. It still had to be a pyramid to agree with the traditional pattern of solar worship 3 but it could now be on a more modest scale. In fact the pyramids of the Fifth and Sixth Dynasties are all of fairly uniform size, each being about one-thirtieth of the Khufu pyramid’s bulk. In addition, the much smaller masses of these monuments did not require the stringent and costly precautions against collapse which had followed the Meidum disaster and which we have discussed above. Consequently, while the constructional pattern of using buttress walls was maintained, the internal masonry consists merely of roughly quarried rubble. 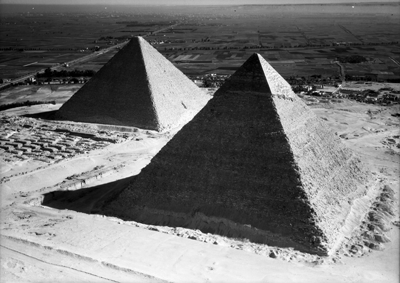 Therefore, these small pyramids, because o. their shoddy construction, did not stand the ravages of time as well as the giant edifices of Giza and Dahshur. Their ruins are of interest to us because they disclose not only poor workmanship, but also the existence of internal buttress walls. Considering the greater ease of construction due to their smaller size and the saving effected by poor materials, it can be estimated that the labour force, which had to be devoted to these pyramids, amounted to no more than 2 or 3 per cent of that lavished on the Giza structures. As far as the communal effort was concerned, the Pyramid Age had definitely come to an end, and although still shoddier pyramids were erected for almost another thousand years after Khufu, their building never again became the primary occupation of the Egyptian people. In order to compensate the pharaoh and his court for the loss of immense tombs, the Heliopolitan priesthood devised an entirely new place of solar worship for the king. This was an imposing sanctuary built for each pharaoh at the very edge of the desert plateau just north of Memphis, near the present village of Abu Gurob. These sanctuaries could be reached by a covered causeway from a landing stage at the Nile which led to a sacrificial enclosure. This contained an altar and a series of alabaster basins to receive the blood of the slaughtered animals. The main feature of these temples, however,, was a novel structure which, in due course, came to replace the pyramid as the emblem of Re. It was an obelisk. The original obelisks of Abu Gurob were, unlike their monolithic descendants, squat and massive structures, closer in concept to the Pyramid Age than the slender spires in the New Kingdom temples. Again it should be noted that the amount of labour required to build these solar sanctuaries was minimal when compared with that lavished on a pyramid.